So far so good on the weightloss plan. Today was one week exactly. Now I am certainly not expecting to continue at this pace but I’m not sad about the progress so far. It’s definitely not easy but there are a variety of foods that I can eat and I’m never hungry and I’m actually not eating all I’m supposed to. Next weigh in / counseling is on Saturday morning. This is what I do for fun at the shop. 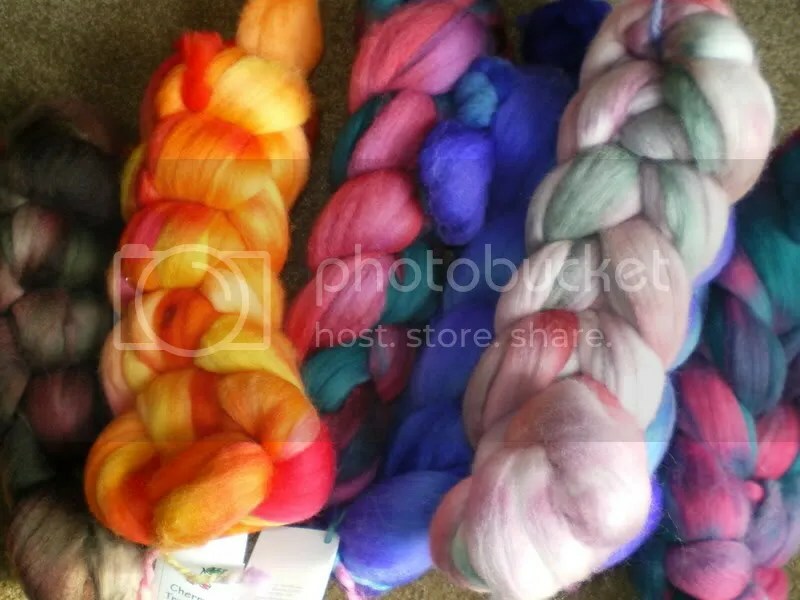 I’ve been braiding roving since I bought the shop. I’m in the home stretch now. I did get this pile all done in one day. 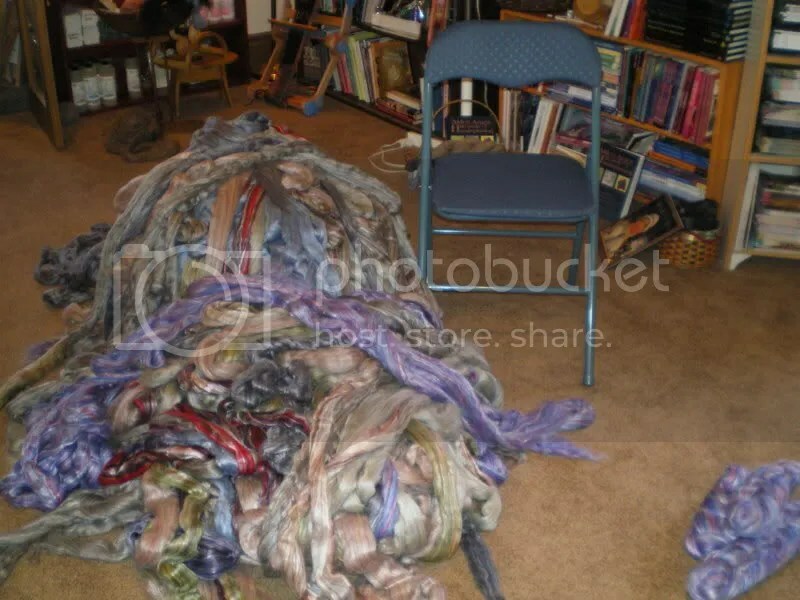 The chair is there for scale and that pile is the multicolor merino/silk blend. This is merino only but you can see the point. 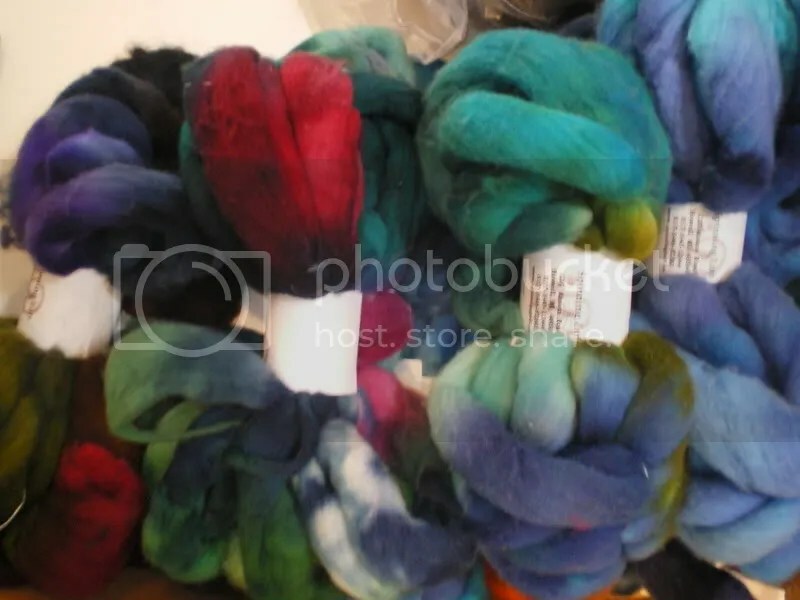 The ball of roving in front is merino and mohair but that is how most of the wool looked except it was all in plastic bags. I have issues with plastic. One of the issues is that it isn’t pretty. So…I started braiding. Did Somebody Say Cherry Tree Hill? Cause I have it! The colors are lovely. Of course this came in plastic bags, too. I braided it. Cherry Tree Hill Merino Laceweight. BEAUTIFUL. 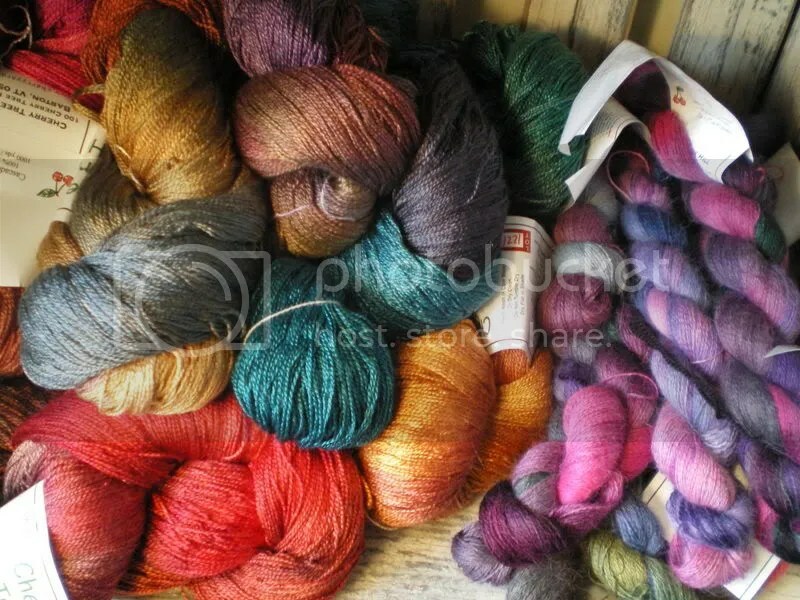 Cherry Tree Hill Silk Laceweight and also Alpaca Laceweight. If that weren’t enough Interlacements came this week in several new colors. Softer colors for Interlacements. I want to spin it all. How can I do that when I can’t even get 4 ounces spun in a reasonable amount of time? My darlin‘ is coming home tomorrow night. He left on the 2nd. I’m glad he’s coming. I miss him in all of the ways you can miss somebody. He’s helpful. He plays with the kids. He loves me. I miss him. 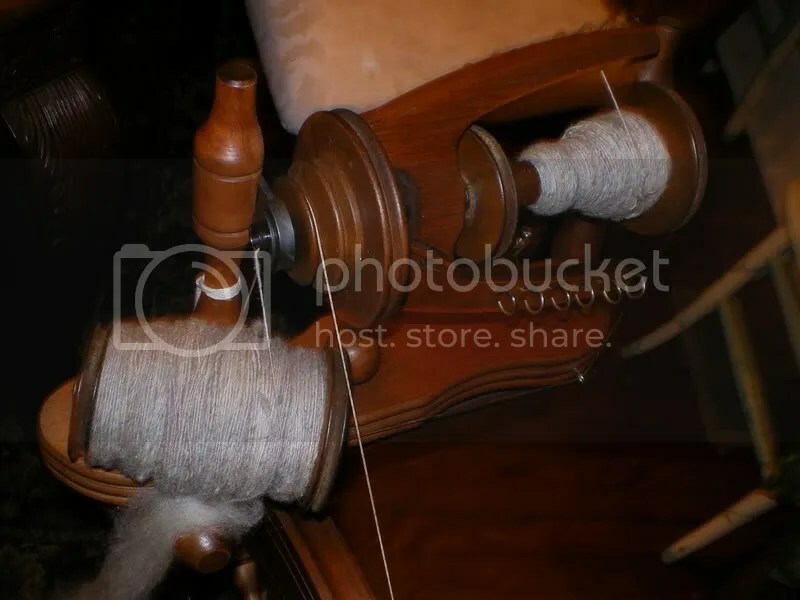 Thats a lot of roving to braid, it is probably extra exercise for you. In other news, your knit mit swap kit is progressing nicely. 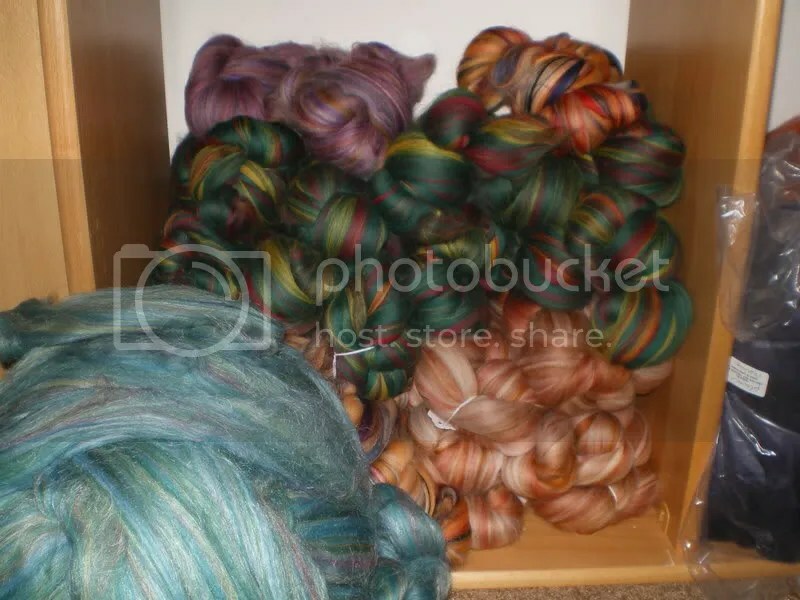 That’s a LOT of roving. And good for you on the weight loss! Congrats on your weight loss! I’m a culinary student and if you need any low fat recipes, let me know. I’ve got about 6 zillion. 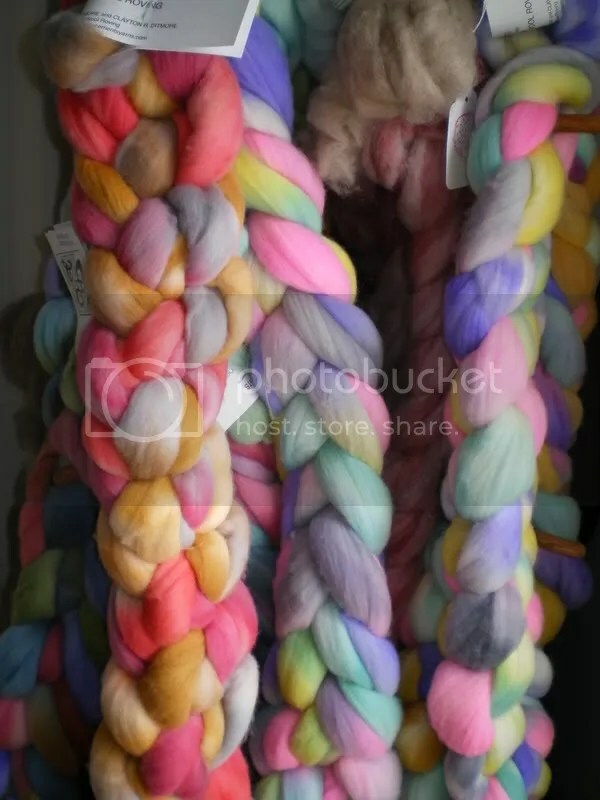 That is a lot of braiding but it is beautiful roving. Congrats on your weigh loss, I have officially started mine too, ugh. I like to eat much more than I like to diet ;P. Oh, yeah, you wont be able to mail it out on Monday, it’s a federal holiday, no mail, banks and schools are closed too. Too bad my work doesnt take it off ;P, I’d rather be spinnning or knitting :). Just wanted to let you know that the sock yarn was finished over the weekend and will be mailed out today! I hope you’ll like it! Yum, candy!! 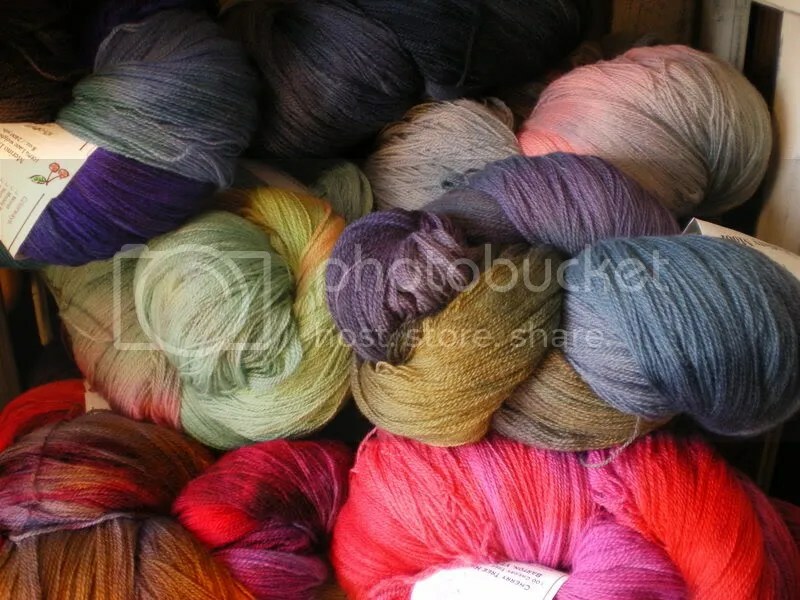 I sometimes think that I could survive on yarn alone…do you think I could lose weight that way? How many calories are in alpaca? Also, I know that knitting doesn’t generally require a great deal of calorie-burning motion, but I’ve been thinking: the great thing about knitting is that you can do it just about anywhere. How about knitting while doing squats? Crunches? Lunges? Your mitt kit is on its way! Beautiful braids, and congrats on the weight loss. Maybe I’ll get inspired and stop this eating train I seem to be on.